I was disgusted with what I saw in the photograph, even though I knew I was supposed to love it. After all, it was a photo of me with my family. Instead, I cringed each time I walked past it. Although the photo included my beautiful wife, along with the beaming faces of my children I’ve loved since before they were born, all I saw was the huge roll of fat hanging over my belt. And the photo was enlarged and huge, so the fat was right in my face as I walked by. This was 2004; I weighed more than 235 pounds then. Although I’d been able to rationalize what I saw in the mirror, I couldn’t avoid that photograph. One of the lobbyists I had on retainer at the time for the political work I was doing told me how he used to be really heavy. He still wore the same watch as he did when he was 200 pounds heavier. It dangled loosely around his wrist. Although he could have removed more than an inch and half of the links from the watch band, he wore it loose as a reminder of what he once was and the work he did to turn his health around. He told me he’d used Weight Watchers and, in fact, still attended weekly Weight Watchers meetings, more than 15 years after he’d lost his weight. I decided to give Weight Watchers a try. The goal gave me an incremental target to focus on and work toward. I didn’t have to worry about losing everything. Instead, it gave me a concrete and seemingly achievable place to start. When I was making all those changes to what I ate, the goal gave me comfort that I was work-ing toward an achievable target. I could focus on the target, rather than worrying about going without my weekly calzone. 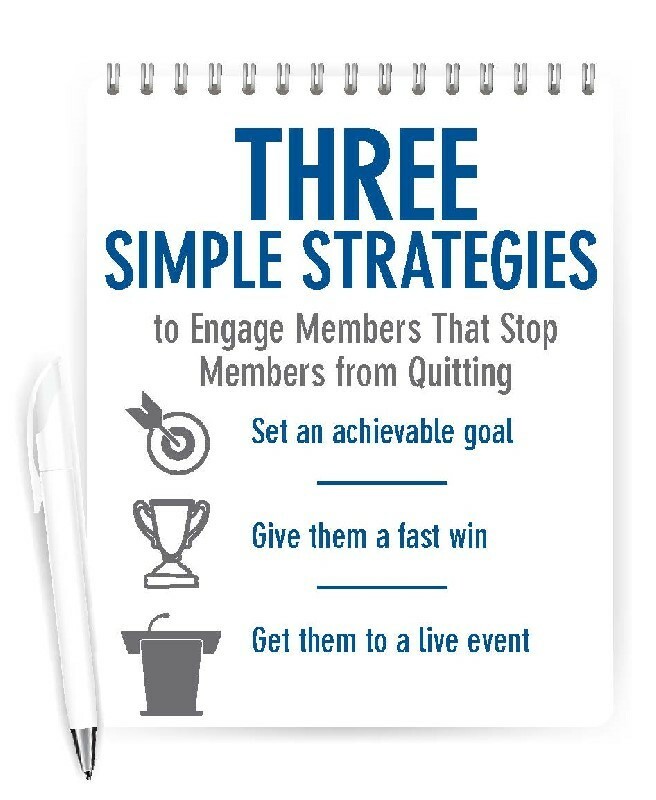 Setting an achievable goal is one of several smart ways to get your new members engaged and to stop your members from quitting your membership program. Notice that Weight Watchers didn’t use my height and body type to calculate my healthy weight and make that my goal. That would have felt HUGE to me starting out! How can you create an achievable, incremental goal for your new members? Are you establishing their first goals based on what you want, or based on a new member’s comfort level? Another key way to engage your new member is to give them your very best strategy — your fastest win — first. This way, they can implement something and experience success right away. There’s more on this in Michael Rozbruch’s story on page two. Auto Training Institute, a coaching company serving the auto repair industry, knew that members who attended their first in-person training were four times more likely to get results and stay in the program. For ATI, I designed a new member welcome package that was a sales presentation of all the reasons why they needed to get themselves to their first in-person training. Seminar attendance increased, and lifetime member value shot through the roof. And what’s better, more ATI members grew their auto repair shops, experienced a lot better results and benefited from their experience with ATI because they attended training. Getting auto repair shops was a win for the shop because they grew and a win for ATI because fewer members quit and their membership grew. I achieved that 10 percent weight loss goal, and several years later, I lost a lot more. And now that I’m eating even healthier, I’ve lost weight since I completed the Boston Marathon in April. What this experience taught me, though, was the importance of starting your new members off with an incremental, achievable goal. Getting your members focused on something they perceive as achievable — in other words, an easy goal — makes a huge difference in whether that member actually engages in your program and benefits from it or doesn’t and leaves disappointed. I recently helped a client to use all three of these strategies within their member welcome. I’ll show you their brand-new, hot-off-the-presses member welcome package in my upcoming live cast: Tribal Membership — Empowering your members to discover themselves within your community. If you want to attend, you’d better reserve your seat right now by visiting www.TribalMembership.com.